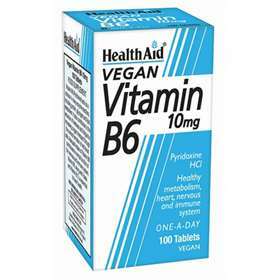 HealthAid Vitamin B6 plays a vital role in the metabolism of carbohydrates, proteins and fat as well as amino acid metabolism, formation of red blood cells and muscles coordination. Vitamin B6 also helps maintain the proper function of the nervous system. Free from yeast, gluten, wheat, soya, dairy, sugar, salt, artificial colours, preservatives and flavourings. Adults can increase up to five tablets daily if required. It is advisable to take these tablets for short periods of time. Bulking Agent (Di-Calcium Phosphate Dihydrate, Microcrystalline Cellulose), Vitamin B6 (Pyridoxine HCI), Anti-Caking Agent (Sillicon Dioxide, Veg. Stearic Acid, Veg. Magnesium Stearate), Coating Methylcellulose (HPMC), Veg. Glycerine.